Conjuring up content ideas for your social media platforms can be a proper pain, can’t it? Creating fabulous online content that sparks conversations, warms up the lurkers, and keeps your marketing wheel rolling like a dream, isn’t easy either. But what if you found out how to make your social more successful? Would it stop you falling in and out of love with your business? Would it help your followers to remain loyal to you? Would it make your social more successful? And your online presence strong? Of course! So, with that in mind, here are some of the healthy habits I’ve discovered over the years that keep my social successful. Give them a try. I’m sure they’ll work for you too. Be Consistent – social media is noisy and competitive, and followers can be fickle – which is why you shouldn’t forget about posting when you’re busy. Spend a pocket of time each day writing content, or brainstorming ideas, or glancing over the previous week’s insights and engagements, and this bite-sized chunk of consistent attention will play a big role in your social success story. Plan Ahead! To get your social media and online content ticking over nicely without forfeiting hours of your day/week, try planning ahead instead. This is a good habit to establish and keep up, especially if you can get a fortnight/month ahead with your content. If you’re unsure how to work out a healthy plan, you can download my free social media planner here. Networking – you might be an online entrepreneur but that doesn’t mean you can’t be a networking ninja. Online networking can trigger all kinds of new relationships, and offer you support and advice when you need it. Even in the virtual world, it’s still very often about ‘who’ you know and not simply ‘what’. Personality – sprinkling bags of your personality into your online content is another great habit to adopt if you want to be a social success. Upload videos regularly to your social media, blogs and web content, add a dash of the ‘out of hours’ you, and let people see a snippet of the personality behind the business. After all, relationship building is what it’s all about, isn’t it, and you can’t do this with a faceless business? Recycle & Repurpose – creating a successful social media strategy or boosting your online presence doesn’t have to be as onerous as you might think. Just squeeze every last drop out of all of the content you create. Turn blogs into social media posts or videos. Elaborate on social media posts and transform them into blogs/vlogs. Pad out your ‘how-to’ blogs/social media posts into mini-programmes or 7-day challenges, or ebook lead magnets. Use your content in as many ways as possible and don’t just share them once, get into the habit of sharing three, four times or more at least, and in every one of your online nooks and crannies. 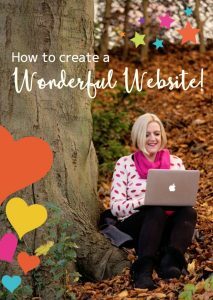 If you’d like help to boost your chances of being an online success, and you think your website’s a great place to start, then please do get in touch! I’ve got lots of packages to suit your budget.